"Of all the dispositions and habits, which lead to political prosperity, Religion and Morality are indispensable supports. In vain would that man claim the tribute of Patriotism, who should labor to subvert these great pillars of human happiness, these firmest props of the duties of Men and Citizens. The mere Politician, equally with the pious man, ought to respect and to cherish them. A volume could not trace all their connexions with private and public felicity. Let it simply be asked, Where is the security for property, for reputation, for life, if the sense of religious obligation desert the oaths, which are the instruments of investigation in Courts of Justice? And let us with caution indulge the supposition, that morality can be maintained without religion. Whatever may be conceded to the influence of refined education on minds of peculiar structure, reason and experience both forbid us to expect, that national morality can prevail in exclusion of religious principle." "I was riding with Mr. Potts near to the Valley Forge where the army lay during the war of ye Revolution, when Mr. Potts said, 'Do you see that woods & that plain? 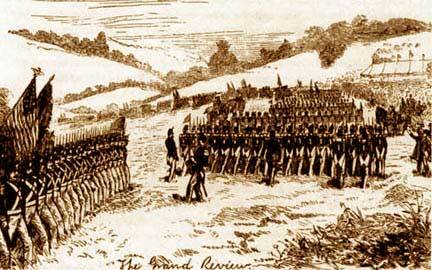 There laid the army of Washington. It was a most distressing time of ye war, and all were for giving up the Ship but that great and good man. In that woods (pointing to a close in view) I heard a plaintive sound as of a man at prayer. I tied my horse to a sapling & went quietly into the woods. To my astonishment I saw the great George Washington on his knees alone, with his sword on one side and his cocked hat on the other. He was at Prayer to the God of the Armies, beseeching to interpose with his Divine aid, as it was ye Crisis & the cause of the country, of humanity & of the world. Such a prayer I never heard from the lips of man. I left him alone praying. I went home & told my wife. 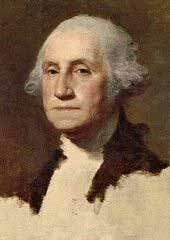 We never thought a man could be a soldier & a Christian, but if there is one in the world, it is Washington. We thought it was the cause of God & America could prevail." Source: Eyewitness testimony of Isaac Potts, a Valley Forge resident who shared the following story with the Rev. Nathaniel Randolph Snowden (1770-1851), who then recorded it in his "Diary and Remembrances." Whoever came up with the government mantra, 'Our strength lies in our diversity,' was no friend of God, man, nor America. While some naively believe it means the importance of having diverse views so that fanaticism doesn't rue the day and that is laudable no doubt, its true meaning lies in the concept of multiculturalism and the redefining of moral and ethical behavior; where very few are perceived to engage in immoral or debilitating acts. This bizarre notion has carried over into national and cultural areas. Rather than elevating the worthwhile ideas and customs from other nations; the foundation of history, culture and philosophy in America are torn down. This is happening in the media, the barrios, the streets but most especially in the schools. So called 'dead white' philosophers and great thinkers are considered passé. This is a grave mistake. God moves through different cultures in different eras. He elevates mankind through his grace and assembling souls to raise nations and ideas. For the last two hundred years or so, it has been America's turn. The attempt to throw out the relevance of Greek and Roman contributions, Christianity, esoteric traditions, advances in political thought from the likes of Hobbes, Locke, Smith and the founding fathers is utter folly. I don't know, call me old fashion even crazy, but doesn't strength always lie in our union, not diversity? It's easy to focus on differences but harder to see the common thread. This humble page is a tribute to one who's presence is not completely understood in the forging of this nation. 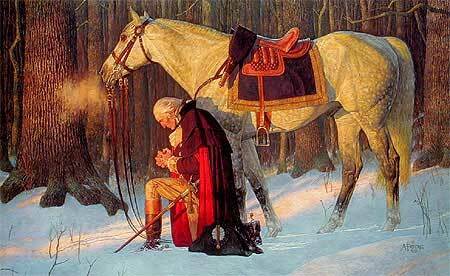 George Washington had an extraordinary connection to God. Those who knew him felt it. Baron von Steuben, a Prussian in charge of disciplining the troops, said no European armies could have survived Valley Forge because of such a lack of discipline. Steuben was right, it was their commander-in-chief that held them together. It was his physical presence but more importantly it was the power and Light of God that he drew down. There are always those who try to tear down heroes and the Christ within. Washington is not free from these baseless attacks. It's easy to view the following stories as legend and fiction. They may be true. "Even if the rest of the world continues to ignore us, we will fight on. For we are fighting not only for ourselves, but for all mankind. We are fighting for freedom and human dignity and the right to worship the God of our choice." • The Speech of the Unknown: An electrifying speech given by an unknown man, galvanizing the reluctant signers of the Declaration of Independence into action. • The Mysterious Rosicrucian Who was the Father of the American Republic The story behind the Speech of the Unknown. and the 800 Year Spiritual Cycle.